Looking for an accessible primer on the state of laboratory mice in biomedical research? 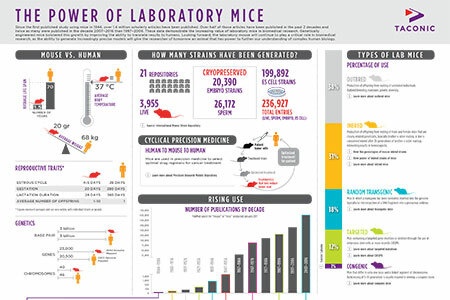 Download Taconic Biosciences' new infographic The Power of Laboratory Mice, or request the infographic as a poster. This laboratory mice infographic can be a helpful reference to those just beginning their work with in vivo research models, as well as to researchers with extensive experience in the lab. It presents information on how the mouse and a human compare, such as in reproductive traits and genetics, and defines the five different types of mice available to researchers. One section shows how mice are being used to help personalize cancer through the use of precision research models, while another shows the number of genetically engineered models that have been developed. The latest version of our laboratory mice infographic also shows a publication timeline from the first published study using mice in 1844 and some of the key discoveries made over the past 170 years. Since that first publication, over 1.4 million scholarly articles have been published — over half in the past two decades. These data underscores the increasing value of laboratory mice in biomedical research, as well as the explosion in the use of genetically engineered mice to improve utility in translational studies.